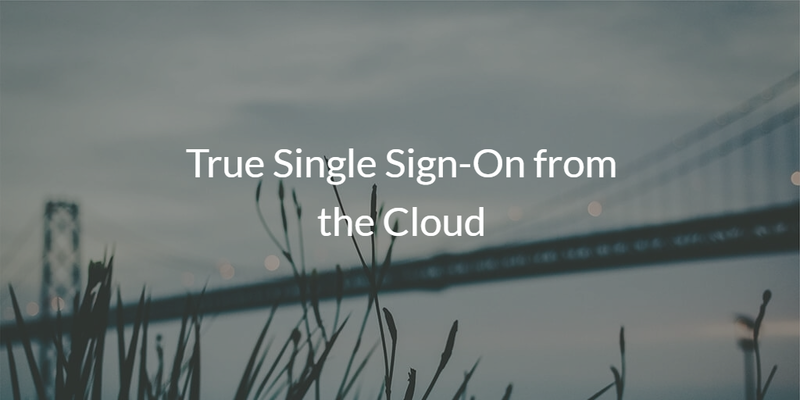 True Single Sign-On™ (SSO) from the cloud is a dream come true for those in IT and for the end user. For IT, it has been a hassle trying to keep track of all the different identities a single user might have in order to access their resources, and not to mention a nightmare when it comes time to deprovision that user from all those resources. For the user, True SSO from the cloud means fewer passwords to remember and easier access to the WiFi, networks, cloud servers, and web-based apps they need to do their job. But is your current directory really a True SSO solution from the cloud? If you’re using a legacy directory service like Microsoft Active Directory®, you’re probably missing out. Let’s take a look at why. In the past, a True SSO solution was possible because IT infrastructure was dominated by Microsoft networks and was largely on-prem. Because of this setup, Microsoft’s Active Directory was able drive the ability for users to login to their machine and then have appropriate access to the network, files, applications, and servers. Over the last decade, the IT landscape has experienced some fundamental changes, and has taken away IT’s ability to offer True SSO to their users. Mac and Linux systems have made their way into the workforce, and the introduction of web applications, AWS cloud servers, and cloud storage have created a wedge between a user and easy access. IT has struggled to offer True Single Sign-On because legacy directories, like Active Directory, have been slow in adapting to these changes. In an effort to remain the dominant platform in the workplace, Microsoft made it difficult to integrate AD with cloud-based apps, Mac and Linux endpoints, and cloud based infrastructure. Web application SSO providers tried to solve the problem, but they didn’t connect users to their systems, cloud servers, on-prem LDAP-based applications, WiFi, and much more. This solution only made it easier for users to access their web applications. Users would still be stuck with having multiple accounts and passwords to access their resources, and IT would still have the nightmare of managing multiple identities. But the nightmare is coming to an end. Now, Directory-as-a-Service® (DaaS) is creating one identity for a user across all of their IT resources that encompasses their systems (Windows, Mac, Linux), legacy and web based applications (through SAML and LDAP), WiFi and wired networks via RADIUS, and cloud and on-prem storage. Our cloud based directory centralizes your users’ identities and offers greater visibility and control over a heterogeneous endpoint environment. If you would like to learn more about how to leverage our True Single Sign-On solution from the cloud, drop us a note. You can also start testing our unified identity provider for yourself by signing up for our free account. Your first ten users are free forever.